● 제품 특징 프로틴 트리트먼트보다는 약하고, 컨디셔너보다는 더 강한것이 필요할 대 사용됩니다. 라놀린성분이 포함되어 건조한 모발엔 수분을 공급하여 줍니다. 건조하고 간지러운 피부는 안정을 주어 편안하게 해 줍니다. ● 제품 설명 린스를 사용하지 않고 린스보다 좋은 효과를 낼수 있습니다. 푸석거리는 모질을 회생해주는 고품질 영양 트리트먼트 입니다. 헹구어 준뒤에 건조해 준뒤 레이져라이트 헤나왁스를 사용합니다. 적당량을 발라 모질의 결대로 스타일을 살려 줍니다. 쵸크나 파우더 사용시는 적당량을 발라준후 쵸크나 파우더를 칠해 줍니다. 쵸크나 파우더 칠해준후 빗으로 자연스럽게 빗어주어 마무리 합니다. 잘 헹구어 낸 후 잘 말려줍니다. 처음 사용시 몰라보게 달라진 모질을 경험할수 있습니다. 자주 사용하지 말고 많이 손상되었을때 한번씩 사용하여 주셔요..
Should be used when you need more than a conditioner but less than a protein treatment. 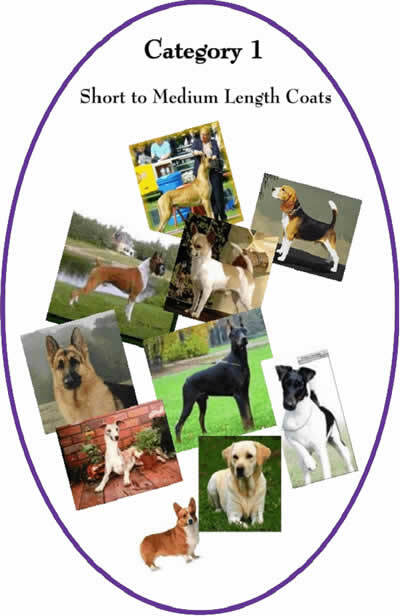 Typical Breeds: Beagle, Boxer, Chihuahua Smooth Coat, Corgi, Doberman, Fox Terrier Smooth, German Shepherd, Great Dane, Italian Greyhound, Labrador, German Shorthaired Pointer and Whippet. The majority of breeds in this group call for a smooth texture where each hair can be easily defined by eye. They should feel slick to the touch with a natural lustre. This category makes up nearly 70% of all breeds. If the coat is in good condition then shampoo with any of the following; Stripping, Lanolin, Herbal or Duo 2 in 1 Shampoo. It is recommended that you use Stripping Shampoo at least every 6 - 8 weeks to ensure that the coat remains free of build up,.although you can use Stripping Shampoo every week. A coat displaying excess build up will look dull and fluffy. You should shampoo the coat twice, ensuring that you thoroughly rinse all shampoo from the coat. It is recommended that you condition the coat with any of the following; Acid Rinse, Balsam or Lanolin mixed with 1 cap of Silk for extra shine and smoothness. Rinse coat leaving just a touch of conditioner. If the coat is in excellent condition and you have used Duo 2 in 1 Shampoo you may not need further conditioning. On show day we recommend either Liquid Diamonds or Show Spray. These can be applied using your favourite grooming mitt with preference given to pure sheepskin mitts. Many of the breeds in this category are not bathed every week. If bathing these breeds it is recommended that the show bath procedures be followed. When you are not completely bathing your dog you can use Dry Kleen which is a waterless shampoo. This type of shampoo is designed not to be rinsed off. Simply spray Dry Kleen onto the coat and place a warm damp towel over the animal. This will lift the dirt, grime and smell from the coat leaving a fresh scent. Follow this procedure once or twice until the coat has returned to the desired state. A Laser Lites aromatherapy oil deodorant is also suggested.